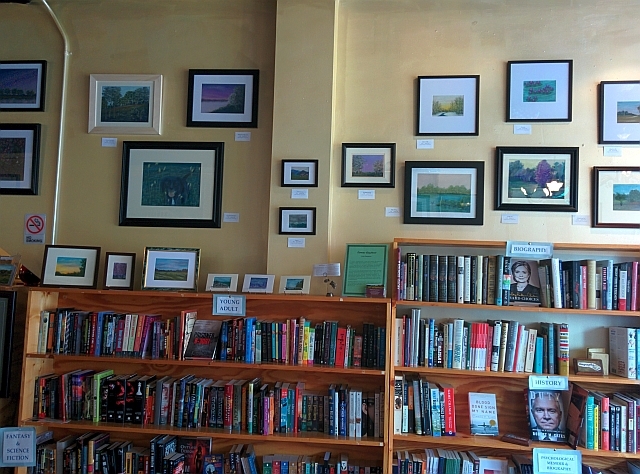 Here's just a sneak preview of part of my wall at Storyteller's Bookstore, where I'm honored to be the featured guest artist for the month of July. Many thanks to Anne Howard for doing such a lovely job of hanging everything! All told, I have 46 original pastel paintings available for sale on the exhibit, along with postcards featuring 10 different images, and I can hardly wait to share my love of art with you at Art After Hours tomorrow evening, Friday July 11 from 5-9 p.m. in downtown Wake Forest.